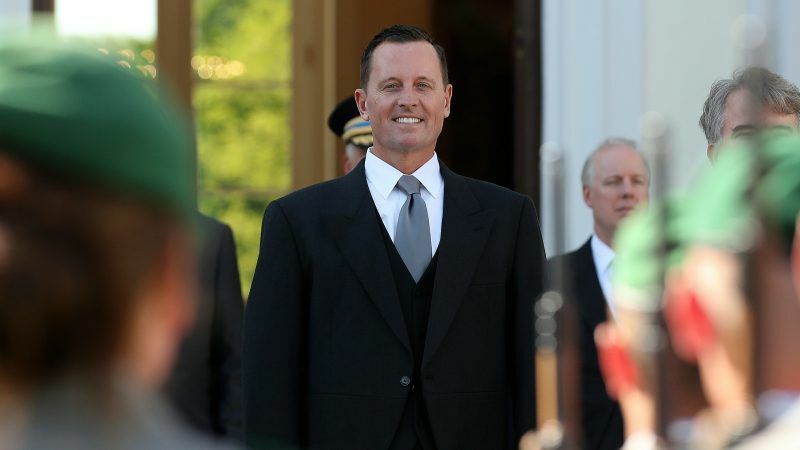 Germany yesterday (4 June) said it had asked the new US ambassador in Berlin, outspoken Trump loyalist Richard Grenell, to clarify his reported comments on far-right website Breitbart that he wants to “empower” European conservatives. A German foreign ministry spokesman said Berlin had “asked the US side for clarification” and that state secretary Andreas Michaelis would re-visit the issue at a pre-arranged meeting with Grenell later this week. Grenell, who took up his Berlin post less than a month ago, was quoted by Breitbart London on Sunday expressing his excitement at a “European groundswell of conservative policies” that had come about because of “the failed policies of the left”. “I absolutely want to empower other conservatives throughout Europe, other leaders,” he was quoted as saying in comments that German politicians and media judged unusually interventionist for a diplomat. Lars Klingbeil, general secretary of the Social Democrats — Chancellor Angela Merkel’s junior coalition partners — led a chorus of condemnation with a tweet in English addressed directly at Grenell. “I know you are still quite new at your post, but it is not part of the job description of an ambassador to interfere in the politics of his guest country, Mr @RichardGrenell,” he wrote. Belgian Guy Verhofstadt, who heads the European Parliament’s liberal group, also weighed in. “We have to defend Europe against Trump,” he posted on Twitter. “It’s not up to his ambassador to influence our elections and steer our society. We respect the sovereignty of the US, they have to respect ours,” Verhofstadt said, adding the hashtag “#GrenellRaus”, German for “Get Grenell out”. The envoy also reportedly told Breitbart that “the election of Donald Trump has empowered individuals and people to say that they can’t just allow the political class to determine before an election takes place who’s going to win and who should run”. But he later took to Twitter to tone down his comments somewhat. “The idea that I’d endorse candidates/parties is ridiculous,” he wrote. Israeli Prime Minister Benjamin Netanyahu, speaking at a press conference alongside Merkel in Berlin, said he had agreed to meet Grenell on his way to the airport later on Monday, but cautioned against reading too much into the encounter. “I am going to meet him briefly at the airport. I wouldn’t draw any meaning into that that just doesn’t exist,” Netanyahu told reporters. Merkel for her part declined to comment on Grenell’s remarks. Grenell is also scheduled to meet with Austria’s conservative Prime Minister Sebastian Kurz on 13 June, the US embassy told AFP. Grenell assumed the post in Berlin in early May, which had been left vacant for 15 months, and on his first day tweeted that German companies should stop doing business with Iran as President Donald Trump abandoned the nuclear deal with the Islamic republic. A 51-year-old gay former US spokesman at the United Nations and frequent commentator on conservative broadcaster Fox News, Grenell is widely seen as a hawkish supporter of Trump’s “America first” stance.